Disney is rebooting its cult classic 80's sci-fi film, Tron , and it wants the world to know. As part of Disney's promotional blitz for the upcoming film, Tron: Legacy , the company has released a free official game for the iPhone and iPod Touch, simply called Tron. The game features unlockable surprise content for users who visit the Tron booth at this week's Comic-Con in San Diego, as well as video trailers and a spruced up remake of the classic Tron Tank arcade game. Tron uses a cryptic, futuristic interface that plays into the new film's aesthetic—a melding of the classic Tron's iconic imagery with the flashy special effects that modern audiences demand. 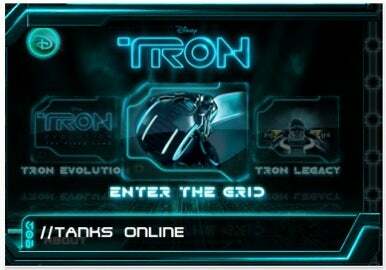 You can tap on different icons to view a trailer for the upcoming Tron: Legacy film, another trailer and game info for the soon-to-be-released Tron Evolution game, and to play a drastically updated version of the classic Tanks arcade game. A "Comi-Tron" icon provides information about Comic-Con's Tron: Legacy Panel, which will take place on July 22nd from 11:15am-12:45pm. It also details a Tron Booth, which will be open July 22-July 25. The game will let users "check in" to the booth via the iPhone's GPS, and doing so will unlock surprise content. Disney states that the app will be updated with free and premium content in the form of games, video, music, and more, as the December premiere of Tron: Legacy draws closer. Tron requires iOS 3.0 or later and is available now in the App Store.